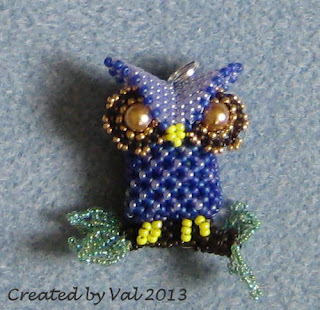 I have a bit more beadwork to share with you today in the form of a little owl keyring made from a pattern designed by Heather Kingsley-Heath and bought at a recent Bead Fair. It is made with size 11 seed beads using needle and thread and the most difficult part was actually assembling the various components once they were beaded and then getting him to stand on his leafy branch. Oh wow Val that is fabulous. Goodness - this is an absolute delight, so much beautiful detail & I love his expression: he looks as if he's pleased as punch to have got himself settled so nicely on that branch "This is MY branch". This is gorgeous Val, it must have taken so long to make. He looks well settled onto his branch now. Val, sooo cute owl! Love your work!! !